Send a Text to SFMOMA and They’ll Text You Back an Artwork #ArtTuesday « Adafruit Industries – Makers, hackers, artists, designers and engineers! At the time of this writing, this is the number of artworks listed in the SFMOMA collection. It’s large. So large, in fact, that we can only show about 5% of it in the galleries at any given time. If you were to walk past each artwork currently on view, you would walk almost seven miles. To show the museum’s entire collection at once would require the construction of another seventeen SFMOMAs and you would need to walk the equivalent of 121.3 miles to see each piece. Studies have shown that the average museum visitor spends approximately seven seconds in front of any artwork. How much can you really appreciate in seven seconds? And even if you did spend seven seconds in front of each artwork in SFMOMA’s collection, it would take nearly three days to see them all. By other measures, however, 34,678 is not such a large number. Type “SFMOMA” into a search engine and it will generate more than 2,400,000 results. 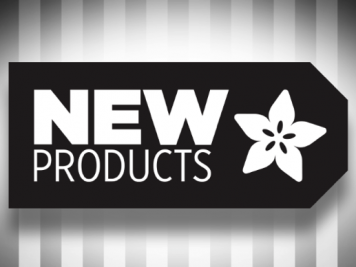 If you were to spend seven seconds with each search result it would take 194.1 days to get through them all. In a world oversaturated with information, we asked ourselves: how can we generate personal connections between a diverse cross section of people and the artworks in our collection? How can we provide a more comprehensive experience of our collection? Enter Send Me SFMOMA. Send Me SFMOMA was conceived as a way to bring transparency to the collection while engendering further exploration and discussion among users. 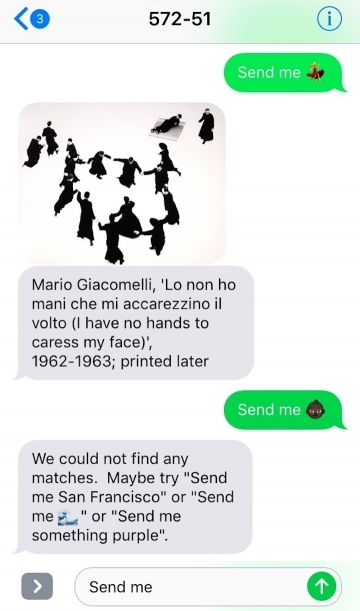 Send Me SFMOMA is an SMS service that provides an approachable, personal, and creative method of sharing the breadth of SFMOMA’s collection with the public. 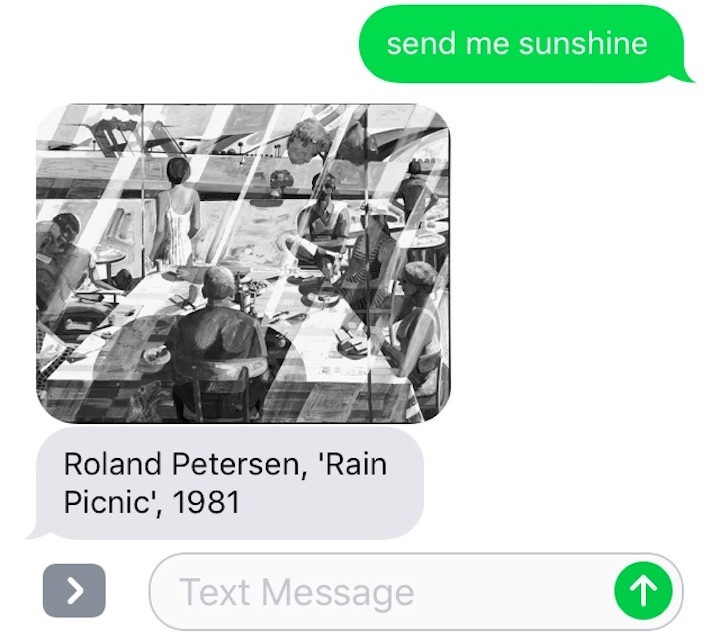 Text 572-51 with the words “send me” followed by a keyword, a color, or even an emoji and you’ll receive a related artwork image and caption via text message. For example “send me the ocean” might get you Pirkle Jones’ Breaking Wave, Golden Gate; “send me something blue” could result in Éponge (SE180) by Yves Klein; and “send me ?” might return Yasumasa Morimura’s An Inner Dialogue with Frida Kahlo (Collar of Thorns). 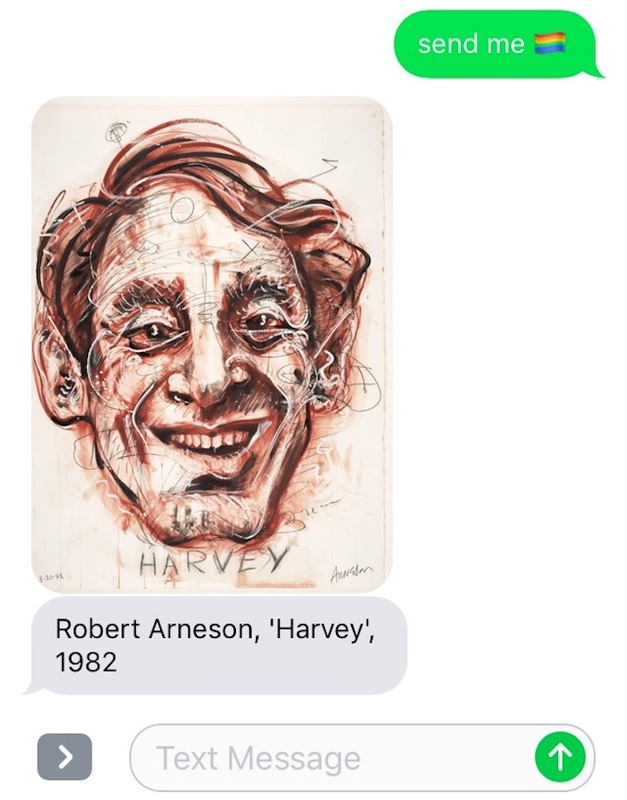 Each text message triggers a query to the SFMOMA collection API, which then responds with an artwork matching your request.